Now that the Easter Eggs have been eaten we decided to look back at all the activities of March and share them with you. 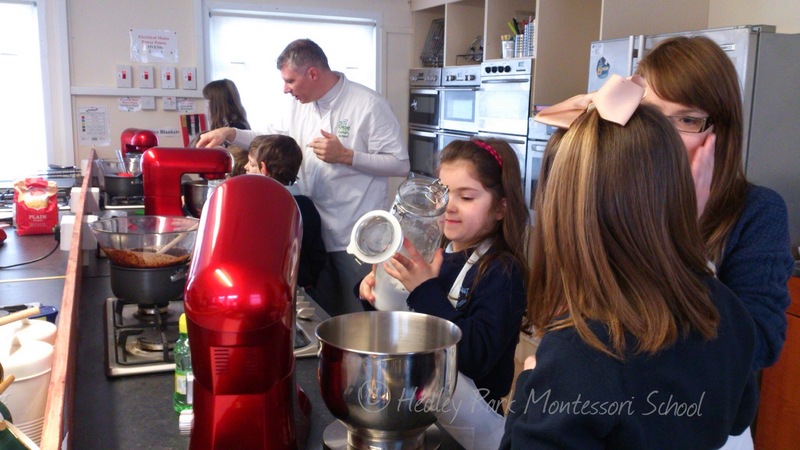 Early in the month we went on a much-anticipated visit to our friends in The Glebe Montessori Primary School in Celbridge. Some of the teachers from The Glebe had come to visit us a week or two before and they invited our senior class to come and have a cooking class in their kitchen with their senior class. We could not wait and on the 11th March with our teachers Ashley and Katie we got on a bus and took a trip to The Glebe. What a fantastic day, we cooked, we ate together, we laughed, and we got a tour of the school and especially the gardens with rabbits and chickens. 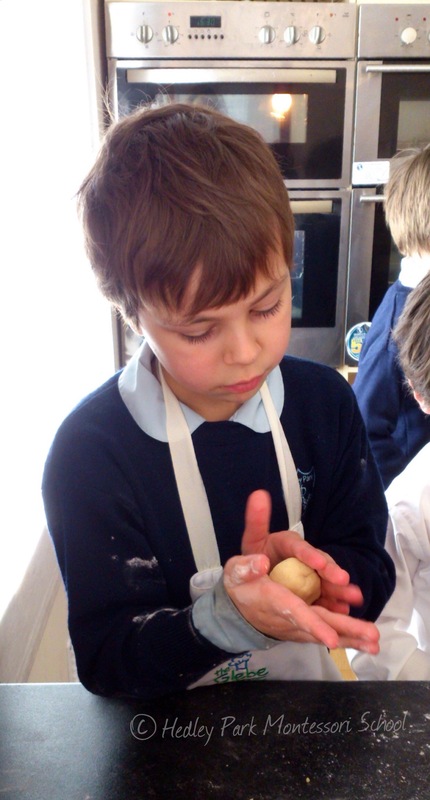 Taking our lovely freshly laid eggs we went to the kitchen and got started. Many hands make light work (and great memories) and we had lots of help from our new friends and their teachers. At the end of the cooking we all went to the communal area where we sat together at huge tables all laid out, and we ate together. It felt a bit like Hogwarts and we loved it! Such an amazing experience for all involved. 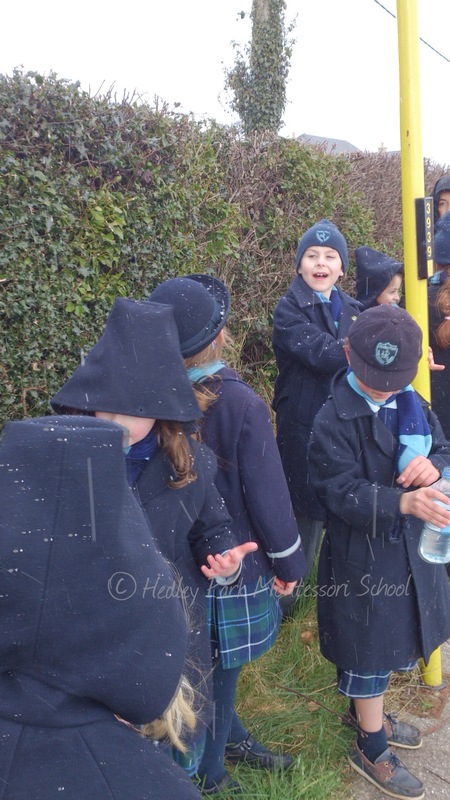 Montessori promoted “wider horizons” in the 6-12 group, by which Dr Montessori meant showing the children the world outside their classroom walls, both physically and metaphorically. Not only giving them a chance to use their classroom learning in real and vital situations but understanding the implications of our actions in the wider community. Demonstrating to these young people why responsibility, tolerance, honesty, dependability and empathy are so important. It also gives them opportunities and situations in which to hone these skills that will be vital to the next generation. Being in a close community like Hedley or The Glebe our children can only experience so much, but connections like these between schools is essential. Thankfully Montessori teachers are a very gracious and connected group but such sharing and friendships between schools isn’t always possible due to geography and transportation costs so we are in an enviable position with our friends in the Glebe. We look forward to returning the hosting very soon. Being responsible and cleaning up. To thank our friends in the Glebe for the wonderful day the senior students made a photo book with personal thank you essays and poems, and sent it to them to commemorate the day. The students of the senior class in The Glebe emailed me with some lovely comments also; here is a sample of both schools observations. A Special Day Out by Anna from Hedley Park. Hello I am Anna. 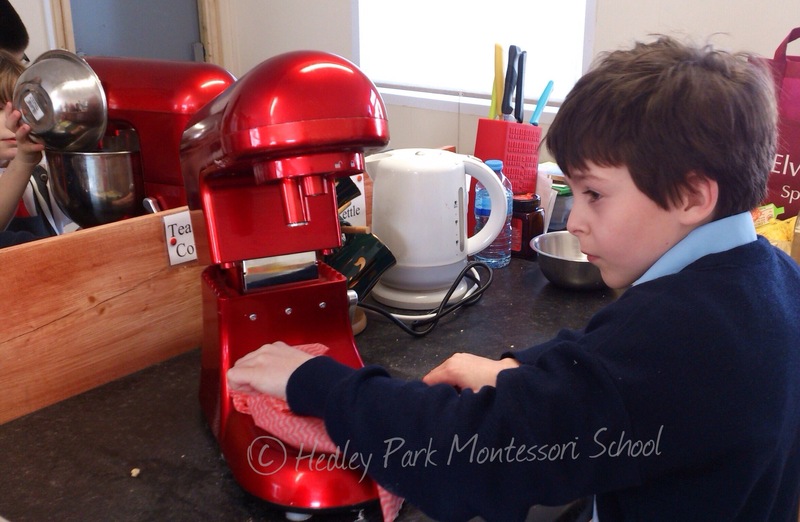 Yesterday I went to The Glebe Montessori School. It took a long time on the bus. The Glebe school was cool. They had one rabbit and six hens. I made a chocolate mousse and some other children cooked jamcookies. They had eight goldfish. They were very nice to us. I had a lovely day at The Glebe. I enjoyed having the company of another school and we had fun. 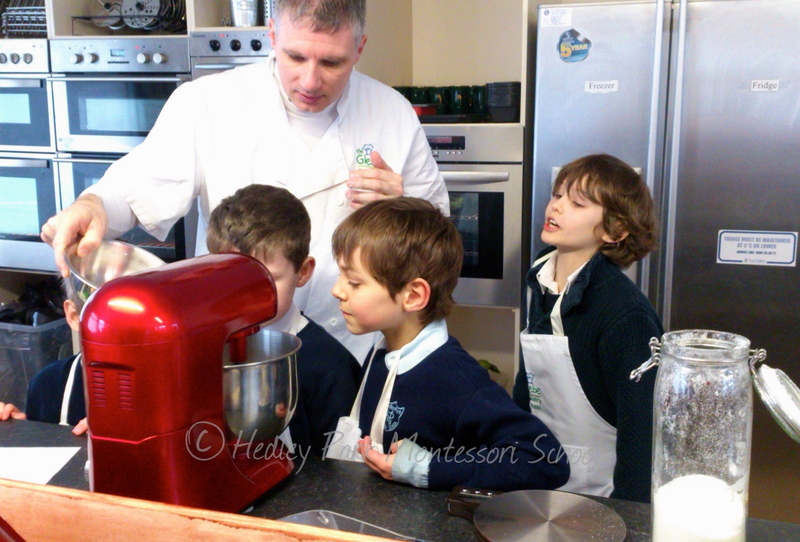 I enjoyed talking to the children from Hedley Park and cooking with them. It was really fun having another school over and it was really enjoyable. The school trip by Scarlett from Hedley Park. I went to the Glebe school yesterday. When we arrived at the school the teachers showed us around. We went into the classrooms, we stayed in the 6-9 classroom. We met some new friends they were very nice. We went outside and had a snowball fight. It was really fun. We then went inside to cook. We chopped some onions and grated the garlic. Then we put tomatoes, beans and sausages on the pan and mixed it all up. Next we cleaned our work space and got a mixer out. 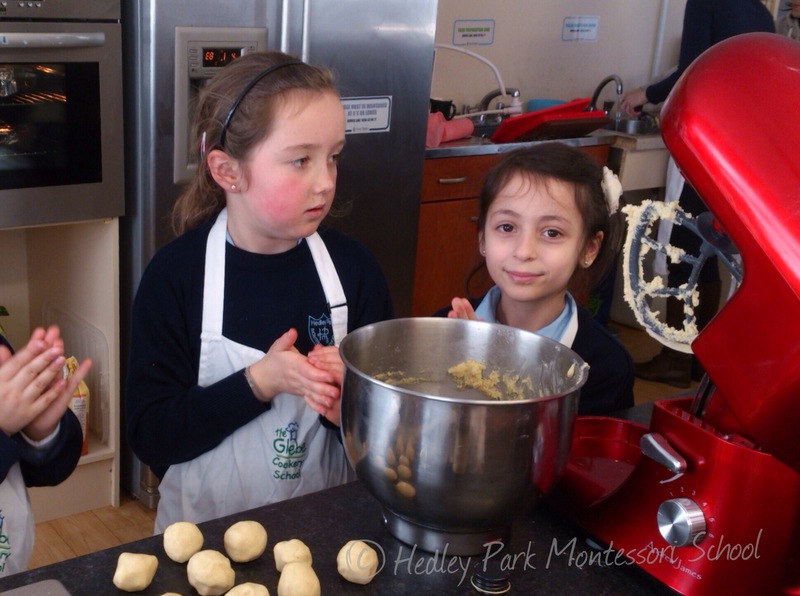 We got lots of butter, sugar and flour, we made some delicious cookies. We also made lemonade. When the cooking was finished we sat down and ate lunch together. I wish the day could start all over again, it was the best day ever! The next day we had yet more excitement, we had a secret visitor! Our leprechaun friend from last year had returned and was looking for his lost teddy. 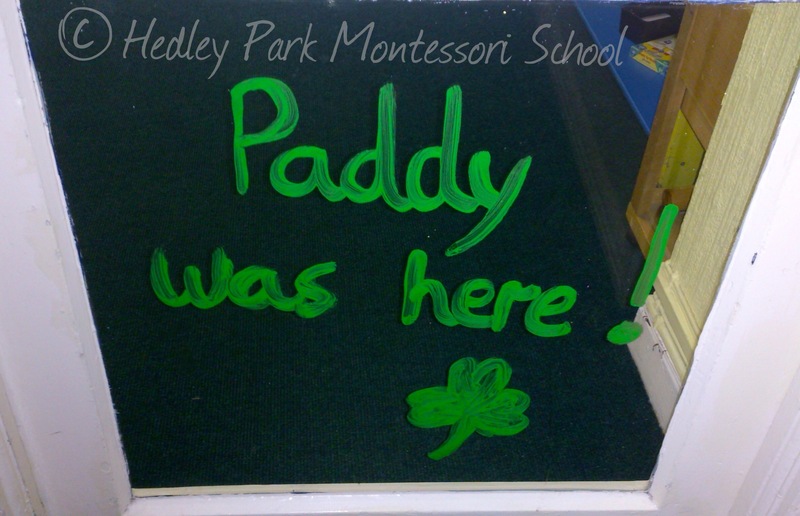 Over the week preceding St Patrick’s weekend his antics got more mischievous and the children really got into the fun. 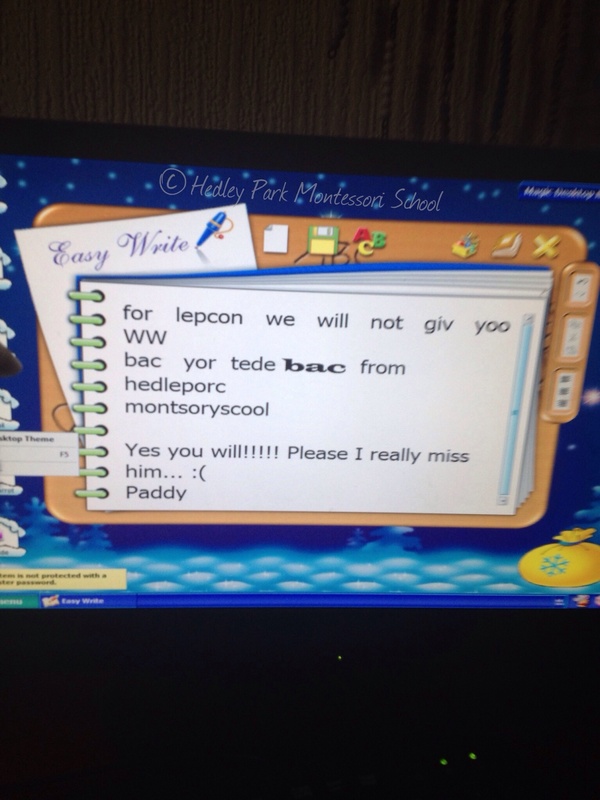 Setting traps, hunting clues, counting the golden coins on the tree and leaving Paddy O’Leprechaun messages on the computer. Each morning everyone was in high spirits to discover what funny prank or message was left for us. 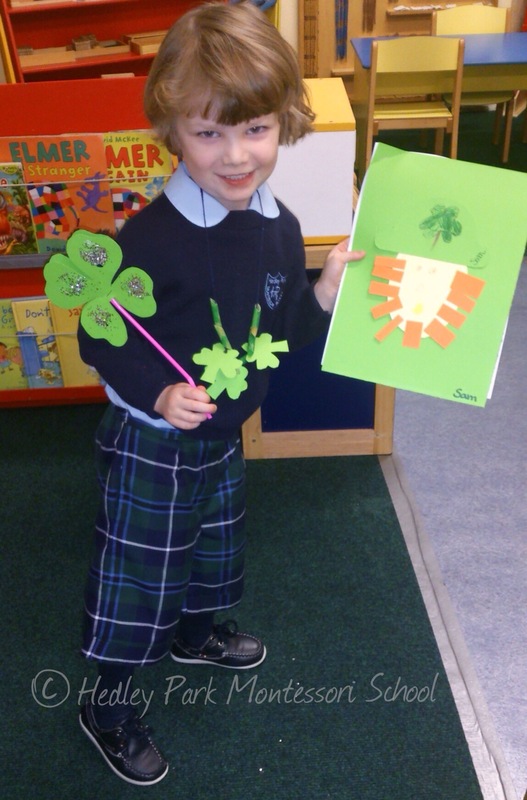 We are craftily getting ready for St. Patrick’s Day. 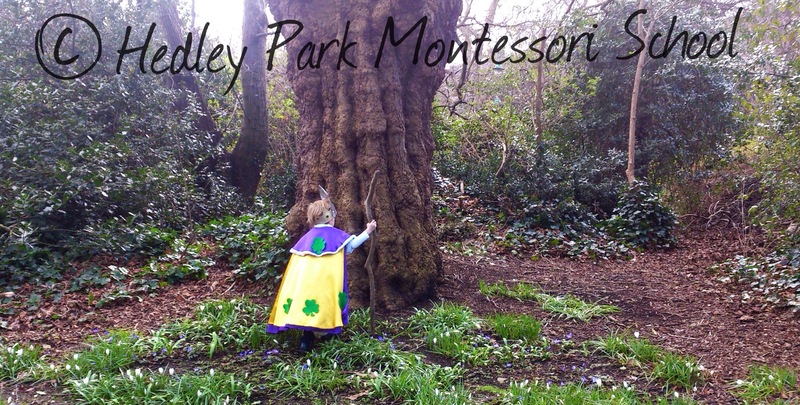 On the Friday before St Patrick’s Day we set off on a treasure hunt to find the man himself. Led ably by our representative of St Patrick we followed clues around the park, stopping for a song a poem and even a bit of a celli until we found Paddy and got our reward. Just when you think we couldn’t possibly fit in any more excitement Easter was upon us! A holiday we all love as its filled with our favourite thing, chocolate! 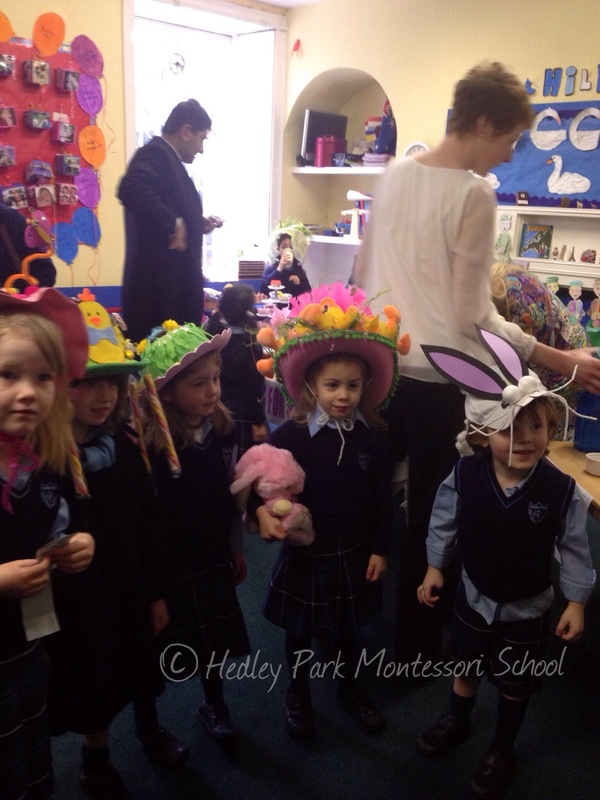 To get us in a sugary mood on Friday we had a wonderful coffee morning and bake-sale, with the added pleasure of an Easter Bonnet competition. The coffee morning raised €350 euro for additional upgrade to our equipment which is just amazing, and a huge thank you to all the bakers and buyers for their generosity. 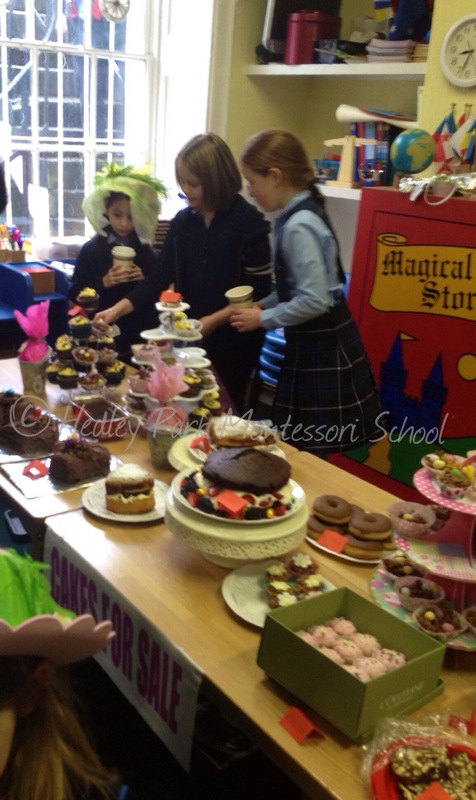 We had a really serious spread of delicious cakes, coffee and hot chocolate. When all was done and dusted we were also able to help the homeless of Dublin by donating 6 large bags of edible goodies to the Fr. McVerry Foundation an all round fantastic result. So I think you will agree that we marched a huge amount of fun, learning and experiences into the month. I for one cannot wait to see what the rest of the spring term has to offer, especially with Open Day on the horizon! Stay tuned for more news on that very soon!